Melbourne first embraced the European coffee culture in the 1960's and the love affair with coffee has not stopped. 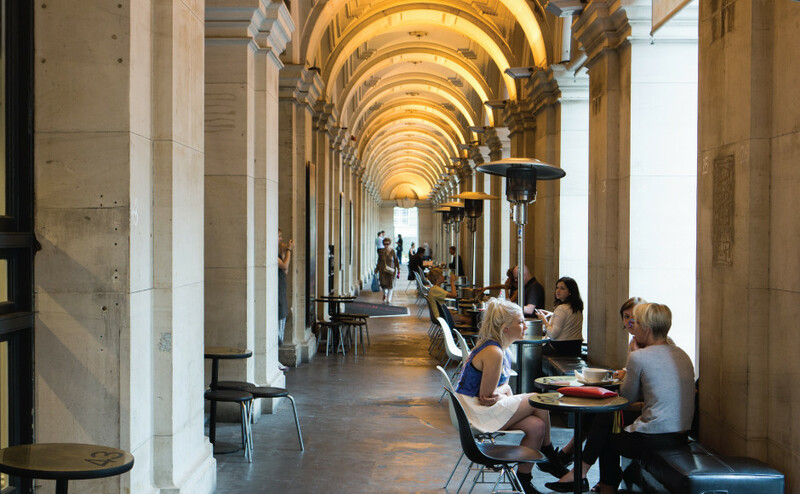 Melbourne boasts superb coffee shops throughout the CBD and suburbs. Scroll down for one of Melbourne's many cafes. 1932 Cafe & Restaurant is located in the arcade of one of Melbourne's most loved architectural icons - the Manchester Unity Building. The cafe is an art deco inspired breakfast and lunch destination a ..
65 Degrees Cafe is a family owned and run cafe conveniently located at the leafy northern end of Exhibition St. Many years experience resulting in amazing coffee and delicious foods. Champion ..
Cafe � Health Food Store � Specialty Grocery Store Welcoming this new holistic lifestyle hub to Melbourne there is a weekend of activities set to keep the whole family entertained. About Life i ..
Breakfast & Brunch Restaurant � Coffee Shop open sunday to friday (saturday closed) Abstract on George Street in Camberwell is a quirky cafe and art gallery for emerging artists. Abstract On G ..
Nestled between two Melbourne icons, Flinders St Station and the Yarra River, Arbory Bar & Eatery is quintessentially Melbourne. Built on what was once a disused railway platform, Arbory is an all ..
where people, food and music connect. cafe, restaurant, live events, functions eat & drink Grab a coffee, a quick lunch or sit down for a meal. The cafe is catered for a quick bite to eat or .. The Atomic Bar is located in the heart of Williamstown's waterfront cafe strip and has become an iconic institution of the area for over the past 20 years. The Atomic kitchen has been taken over by ..
Baby PIZZERIA & SALUMI BAR WALK-IN RESTAURANT 631-633 CHURCH STREET RICHMOND Walk in cafe & pizzeria Open 7am - late Weekends 8am - late (every day except xmas day) ..
AM: Coffee & Jaffles PM: Late night Boozy Bakery Bad Love Club is a takeaway coffee & jaffle bar by day and a bakery + bar by night. Bad Love Club is open early for Sensory Lab coffee, breakfa ..
From Alfredo and Lisa La Spina, the people behind Bar Idda in Lygon Street Brunswick East, Bar Paradiso is a charming local day-time cafe, which will transport you to a timeless vintage espresso bar i .. The Big Dish Cafe in Thornbury for great food, great coffee, great atmosphere! Recommended by The Age Cheap Eats 2010 Monday - Friday | 8.30am - 4.30pm Saturday - Sunday | 9.00am - 4.30pm .. Situated in the heart of High Street Northcote is Melbourne's favourite cafe.. Black Pepper Cafe Open 7 days a week serving sumptuous breakfasts, tasty snacks, juices and fine Segafredo Coffee. ..
A lively cafe in the main street of Sunbury offering a wide range of light meals and refreshments daily as well as the best value and best tasting coffee in town. Breakfasts, morning teas and lunches ..
Our newest cafe, eatery and bar at Hamer Hall alongside the Yarra River presents a selection of the finest locally-sourced produce. Bombini Buzz presents a symphony of flavours for every palate. ..
Brunetti began trading in 1985 as an authentic Italian Pasticerria located in Carlton. Since then, the business has grown into one of Melbourne's iconic cafes, supplying local and interstate custo ..
Burnham Bakery at Eastland LOCATION Shop K208, Eastland Shopping Centre VIC 3134 T: +61 3 99691 3888 OPENING HOURS Monday to Wednesday 9am - 5:30pm Thursday and Friday 9am - 9pm Saturda ..
Level 2, Emporium Shopping Centre From pastas to parfaits, the Cafe Blush menu boasts dishes with traditional Italian elements and innovative Japanese flavours. Created using authentic brined ..
Cafe B� is proud to be a small cafe, that has plenty to offer. We have a downstairs takeaway servery, with a bar to enjoy the atmosphere of the coffee being made, alternatively and a very attractiv ..
A unique coffee bar serving the best coffee in West Footscray Breakfast at Cafe Centro Lunch at Cafe Centro Dinner at Cafe Centro CAFE CENTRO 9 Ashley Street, Braybrook, VIC 3019 Monday ..
Cafe Greco is a proudly owned and operated by a family business, ensuring that prices are kept low, but quality remains high. With fresh quality food, amazing tastes and exceptional service to matc ..
Cafe Heide is located opposite the main entrance and offers great coffee, simple, fresh food and fast, friendly service. Dedicated to offering seasonal produce from the Heide I kitchen garden, Caf ..
Hi there! My name is Cafe on Albert. I live at 90 Albert street in East Melbourne, opposite the East Melbourne tennis centre. I am the most rockin cafe on the block! My owners and staff are a mixture ..
Cafe Palazzo is a cafe situated in Highett, amongst a friendly neighbourhood. This cafe offers all day breakfast and lunch. There is a wide range of food and drinks on the menu, consisting of cold .. The original Cafe Vue offers a cafe menu for both breakfast and lunch featuring a range of made to order sandwiches and baguettes, high quality cakes and viennoiserie as well as exceptional coffee by .. There are two Cafe Vue locations at Melbourne International Airport. Cafe Vue Express Landside Terminal 2 (near the international check in counters). Accessible to all visitors to the airport fo ..
Caffe Moravia, established for over twelve years, specialises in Italian pastries, excellent coffee and award winning baristas. Offering breakfast, lunch and dinner with new special menu every 4 weeks .. Located in Caulfield North's vibrant shopping strip, Caffe Si offers a uniquely healthy alternative, specialising in mouth watering, completely made-for-Coeliac gourmet foods, divine vegan and vegetar ..
Medieval-themed cafe/restaurant serving morning and afternoon teas, light luncheons*, high teas*, devonshire teas*. (* requires prior booking) Camelot Castle is set on 10 acres in a beautiful part .. Mobile fresh ground coffee, delicious muffins & cookies delivered to your workplace throughout Melbourne! Also, vans available throughout Melbourne to service your next event or private function. ..
Gentlemans Outfitter and Cafe Captains of Industry Barbershop Shoemaker Tailor The practitioners of Captains of Industry are Practical Men of Wide Experience offering the Good, the True and the .. Situated by Melbourne's iconic Albert Park Lake, the Carousel Cafe boasts one of the finest views of the CBD, parkland and waterfront. Take a break, enjoy our seasonal a la carte breakfast and lunc .. Inspired by the trains of yesteryear that once travelled what is now the Warburton Trail, The Carriage Cafe Seville is the perfect place for all Trail users to take a break and enjoy the hospitality i ..
Melbourne's very first Cat Cafe is conveniently located on the Queen Vic Market round-about, so pop-in, play with the cats and then enjoy a cuppa. Australia's first cat cafe where you can come and ..
Charlie Lovett: Roaster, Baker, Pizza Maker roasts award-winning coffee beans on site. Take beans home to make yourself, or get your coffee fix from one of Charlie Lovett's skilled baristas. Charli ..
Charlotte's On Canterbury is a cafe located on busy Canterbury Rd in Surrey Hills. Charlotte's On Canterbury serve great coffee, in fact openly promote 'Best Coffee Gurantee' to ensure that you wi ..
Chaucer Cellars is a small independent Enoteca located in Glen Iris part of Melbourne's Inner South Eastern suburbs. A staunch supporter of small production wineries, this store has been trading under .. Located right near the South Melbourne Market on Cecil Street, CheekyChinos is a unique concept that provides young families with simple, high-quality European inspired food, exceptional coffee, a sig ..
With its signature blend of coffee and chic cafe fare Citizen lies on the city's edge with fun and fresh local produce, bringing its multiple personalities to south wharf. You can enjoy indoor and .. Falling in love with Cuba is a seductive experience. And, at Coco Cubano, you can sample this experience; indulge your passion for the rich and redolent. We're open early, and we stay open 'til late. ..
Coffee Hit: Australian Specialty Coffee Roastery Cafes Coffee Hit Roastery Cafes bringing the best of Melbourne's specialty coffee culture to the whole of Australia. Visit us in-store or shop .. In a coffee-centric community in Melbourne's north, Coffee Hit Thornbury is our first high street store, opening in May 2018. Located on High Street, under newly built residential building, The Hi ..
CO-GROUND COFFEE NEW LOCATION! Corner of Brunswick Rd & Black St. Brunswick 7am - 3pm, Wednesday - Sunday Co-Ground Coffee is open Wednesday - Sunday, 7am - 3pm. Come down and treat yourse ..
Cafe � Restaurant Serves breakfast, lunch, dinner, drinks and coffee We pride ourselves on using only the freshest seasonal produce. Now open for our dinner menu, let your taste buds trave ..
For a freshly prepared sandwich with a gourmet twist, head to 'Country Bred on Lonsdale' at lunchtime. Open Monday to Friday, from 11:30 a.m. to 1:30 p.m., we craft quality sandwiches daily, using .. The Court Jester Cafe in Brunswick serves Polish / Ukrainian inspired breakfast, lunch and dinner. Everything on the menu is an accumulation of over six generations of family recipes. Dishes incl ..
Crafternoon is a whole new cafe experience. Nurture your creativity with arts and crafts from our make menu while enjoying a coffee and one of our delicious all day breakfasts or lunches. Our ki ..
Damon Bradley is Southgate's New Dessert Bar featuring cocktails, high teas and indulgent desserts. Southgate Restaurant and Shopping precinct. Damon Bradley's menu includes an extensive list of .. The Deck Brighton - Cafe, Paleo, Function Venue in Bay Street Brighton The Deck Brighton is located at 212 Bay Street, in Brighton. Located just 100 meters from the North Brighton Train Station, o .. Superb cuisine available for breakfast lunch and dinner meticulously prepared by one of our outstanding chefs. Sumptuous meals and delicate pastries and treats are available all day from your local ..
Dixons Creek Café Bar & Grill is located just 46klm from Melbourne in a small community just north of Yarra Glen on the Melba Highway. Our local wine list has been selected to complement our stea ..
Australia's first dog cafe, raw dog food & dog accessories store is open in Collingwood. In the back courtyard, 10 gated booths are available for dogs to dine in, with a dedicated kitchen plating u ..
We're a cafe with organic and fair trade coffee, organic yummy food, home-baked treats, cooked breakfasts, great atmosphere. We love our customers, and all are welcome. You can join our monthly bo ..
- HISTORICAL HOMESTEAD - - ART GALLERY - FUNCTION CENTRE - EVENT VENUE - LITERATURE CENTRE - - CAFE - TEA ROOM - Dromkeen Gallery- Australian Children's Literature Centre, Gallery, Function Cen ..
"Food is our passion!" Our aim at Due Passi Cafe is to give the customer a taste of eating in a Traditional Italian Trattoria. Based in the heart of Mebourne - 167 Queen St. Open for .. Enjoy a delicious meal with an awesome view! Join us for lunch or grab a snack at the Eagle Café located at the Summit Station. Delicious food is our specialty with pies, sandwiches, salads ..
"Encuentro" is an amazing and interesting retail/cafe located in the heart of Richmond. At encuentro you will find a retail/cafe with unique gifts sourced from different parts of South America, Au ..
Errol's Licenced Cafe, Restaurant and Patisserie is located right in the heart of vibrant Errol Street, North Melbourne, opposite the Town Hall. We pride ourselves on providing great food all day, ..
A cafe with a conscience, in the heart of Fitzroy. Sit in and enjoy or 'grab and go'. Our name was born from our desire to have a good 'ethos' at the heart of everything we do. This takes a nu ..
Evan Espresso is stylish cafe with a funky vibe, great meals, superb coffee and lots of home style gourmet treats. Experience the relaxed atmosphere and inviting courtyard. Ample parking available beh ..
Federal Coffee Palace was one of Melbourne's grand hotels erected during the boom of the gold rush days. Today Federal Coffee Palace is one of Melbourne favourite cafe's conveniently located in Melbo ..
Fox in the Corn Cafe There's no doubt that we're all becoming more aware of what we eat. You'll be sure to taste the difference with our focus on fresh ethical produce, whole ingredients cooked slo .. Welcome to our cafe, Friends of Mine.... Simply a place to meet, ponder over a glass of wine, read a great book, get your daily fix of caffeine, laugh with friends, devour the perfect hangover brea ..
We are an ethical organic food store and cafe created with the community's health and well being in mind. We provide a people-friendly shopping and cafe environment where you can relax and purcha ..
Fussy Pots is a family friendly cafe. We serve modern breakfast and lunch items. Kids can draw on the paper table cloths, play in the cubby house. We're striving to provide our local community with a ..
Galleon Cafe is a little gem of a cafe that's been a local's favourite for eons. There is a laid back energy that washes over you from the moment you walk through the door. Whether it's the mismatc ..
We founded Gloria Jean's Coffees in Australia more than fifteen years ago with the ambition to serve the best coffee in the country. We currently have more than 400 coffee houses, presence in every Au .. The Goat lives in the heart of Elsternwick, close to the Classic Cinema and a few doors from the Elsternwick Station. We are Coffee. We roast our own blends on site and our baristas know their trad ..
Good Times Milk Bar is an all day cafe in Bentleigh. BREAKFAST ALL DAY LUNCH FROM 11AM CATERS FOR ALL A PLACE FOR GOOD TIMES BURGERS SIDES SHAKES TAKE-AWAY & DINE-IN broadsheet.com.au ..
Good to Go Cafe, Hosier Lane, Melbourne CBD ..